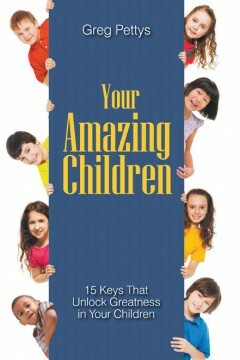 Greg Pettys has given us a wonderful guide in his book, Your Amazing Children, 15 Keys That Unlock Greatness in your Children. It is insightful, revelatory, practical and truthful in its approach and conclusions. With practical experience, discernment and wisdom, Greg leads us on a journey through the Mountain Peaks of Joy and the Dark Valleys of unexpected challenges while still keeping our focus on the final goal of unlocking our children’s greatness. There is comfort for our pain, wisdom for our decisions, and strategies for our success as parents. Children are champion carriers of divine gifts into the next generation. It is every parent’s responsibility and privilege to steward and shape the formative years of their children by training, modeling and telling the truth. While not even God will overrule the will or decisions of those children, the opportunity to unlock their greatness and implant principles of eternal truth that will shape those decisions is always existent. No matter where you are in your parenting or grandparenting experience, you will be blessed and equipped as you read this book.